I've never made a Meme before (if only I was more witty) but I was watching Let The Right One in the other night and this thought occurred to me. If you haven't seen this amazing Swedish film then go out now and rent it, or even better buy it as I'm sure you'll watch it a few times. They did an American remake, Let Me In, which is surprising good; I normally shudder when they redo foreign language films, but this ones stands up well to the original. In short it's set in a bleak grey Swedish suburban apartment block. A delicate and tender romance builds between the neighbouring protagonists, one of which happens to be a vampire. The cinematography is delicious, the acting is astounding, and somehow this strangely fantastical story happening in such mundane surrounds works perfectly. 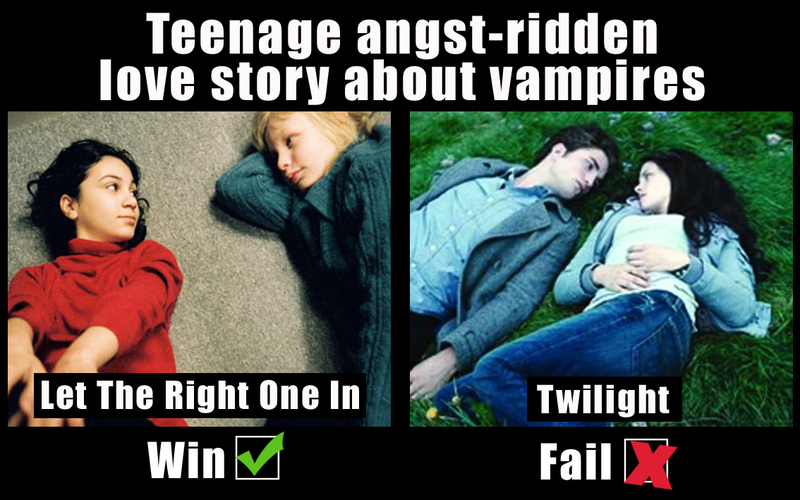 I've written before about how I know Twilight is really terrible but that I enjoy it anyhow, like a not-so-secret guilty pleasure. When comparing the two films Twilight comes out looking more like a comedy than a romance. Anyhow, I hope you like my first Meme, maybe I'll have more flashes of inspiration, feel free to share it on facebook/pinterest, but please link back to here if you are, thanks!